Last week we discussed Volatility Breakouts which are an incredible strategy for catching wide range weekly moves off the Monday ‘open’ long and / or short. The silver setup discussed in our last update triggered trade entry @ 32.281 on Tuesday 4th September and trade exit @ 33.8473 this morning 1AM EST Monday 10th September: booking us a total +15,600 pips profit and a payoff 2.76 times our initial risk. 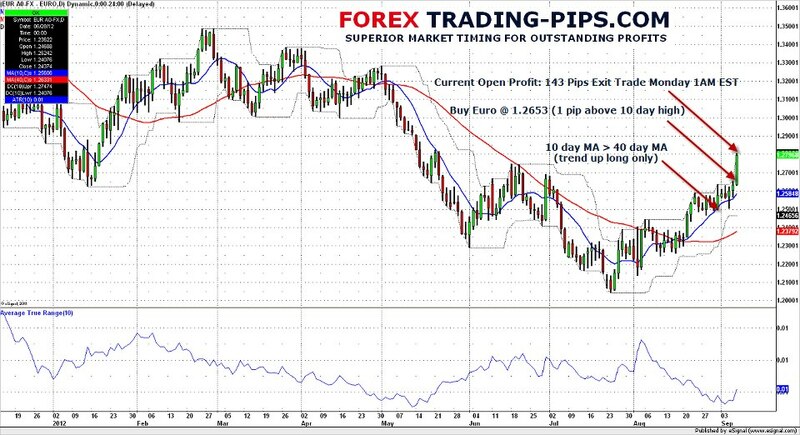 Last weeks explosive move higher in risk assets also triggered Friday breakout ‘One Night Stand‘ trades across a number of markets including EURUSD (+131 pips profit) and XAGUSD (+82 pips profit). 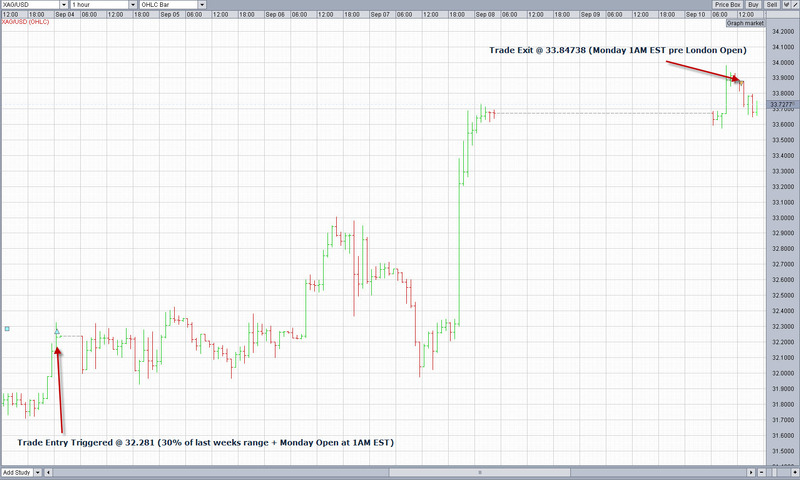 Below is a chart of euro One Night Stand breakout which we updated on our FaceBook Fanpage last Friday. The most important thing to understand about breakout trading is that markets can spend a lot of time chopping around in ranges. Volatility breakout is one of the most robust trading methodologies and performs incredibly well when markets trend, but once markets move into trading ranges these breakout strategies perform poorly. 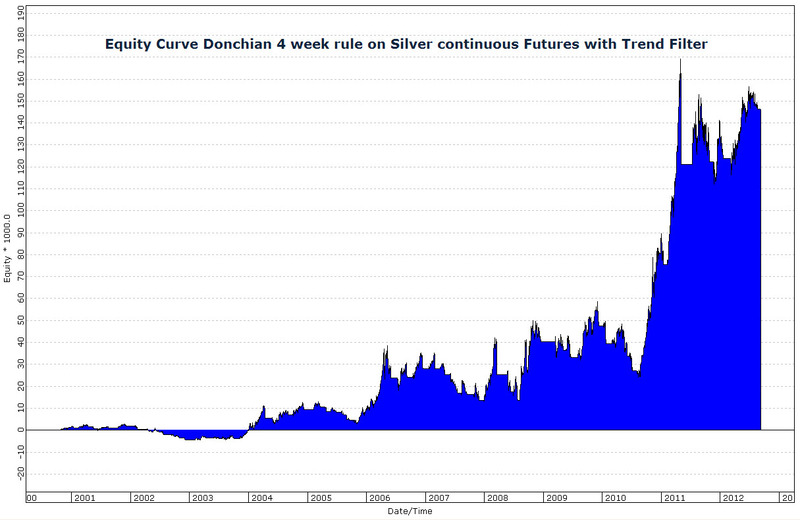 Note the Donchian Channel 4 Week Rule equity curve on Silver Futures below. Performance is great, except when it isn’t… those downward spikes in performance mark periods where markets become range-bound and choppy (see the sharp drop in equity mid 2010). Range-bound choppy markets can cause painful losses for breakout traders… which raises the question: how do we catch explosive outsized moves in the markets without getting chopped up when markets consolidate? Trade Filter No. 1 – Trend Filter: only take trades in the direction of the most recent n day high / low. 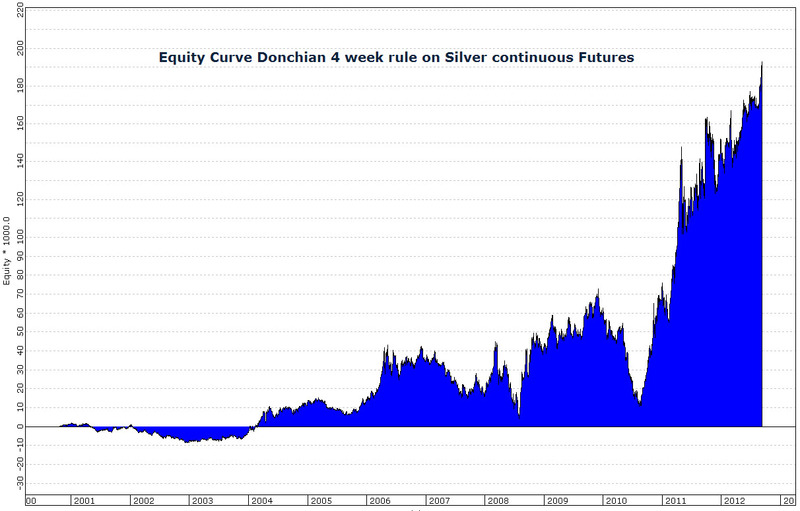 Below is the equity curve of the same Donchian 20 day high low system with a 150 day trend filter applied. Although our total returns are reduced by employing a trend filter, our draw-down is cut proportionately more: profit factor increases from 2.18 (no trend filter) to 2.89 (with trend filter). What this means is that by applying additional leverage with the trend filter we can achieve the same returns as before, but with less downside risk. Trade Filter No. 2 – Volatility Filter: Market volatility is cyclical. By increasing trade size during the low volatility expansion phase and cutting back size during high relative volatility we can significantly improve trading performance. Short term volatility filters: Nr7 (narrowest range of the past 7 trading sessions), inside bar and squeeze filters are some of the best ways to identify low relative volatility conditions and pre-empt the next powerful volatility expansion breakout move. Trade Filter No. 3 – Up / Down Filter: One of the most simple short term counter trend trade setups is the up down filter: if the last bar was up then we take shorts only, if the last bar was down then we take longs only. The beauty of the up down filter is that it puts you on the contrarian side of the market. Traders tend to chase short term moves in the markets, by waiting for the bar to close up or down and trading against this direction you are fading market greed and fear. Trade Filter No. 4 – Overbought / Oversold Filter: There are a number of ways to determine overbought / oversold conditions in the markets, one of the best performing methods is the 2 Period RSI indicator popularized by Larry Connors of ‘Trading Markets’. Simply take the 2 period RSI and monitor the reading: if RSI closes below 10, the market is oversold and due a bounce; if RSI closes above 90, the market is overbought and due a selling correction. Remember markets can remain overbought and oversold for extended periods, the RSI indicator simply alerts us that the market has reached an extreme level and that the odds favor a reversal. By applying a volatility breakout entry requirement to the overbought / oversold condition we are forcing the market to prove itself before we commit ourselves to a position. Our Trade Filter plus many more Robust Trading Strategies can be found at our Forex Strategy Pages.